Happy Friday everyone! I’m really excited have the chance to tell you about a book that is fresh off the press! Amanda of i am baker has created the most beautiful book called Surprise-Inside Cakes and it is hot off the presses — just released Tuesday! If you have kids, you need this book. If you have a family, you need this book. If you have friends, you need this book. If you love cake, you need this book. Basically, if you’re breathing, you need this book. It is filled with the most beautiful, creative, and amazing cakes. There is literally something for everyone in this book and Amanda makes it SO easy. I can’t wait to start baking these beautiful cakes. I had originally planned to make one and share it with you here but truth be told, I just wanted to share this book asap. And…kids. They make things difficult. I’m definitely going to make one of these for E’s 4th (!!!) birthday party in September. She ooohed and ahhhed over so many of these cakes — especially the Rainbow Cakes and the Smiley Face Cake and the Butterfly Cake and the Bunny Cake. 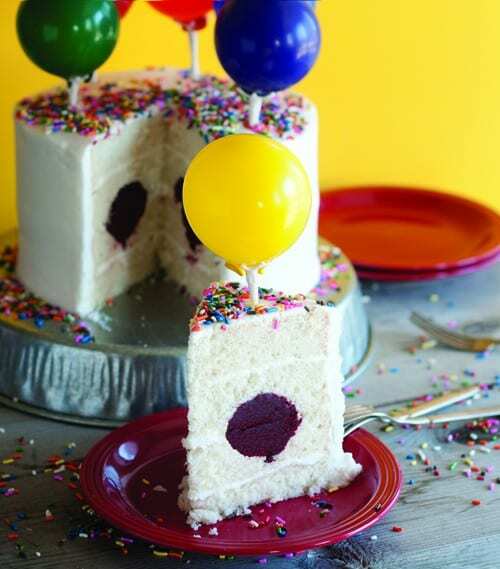 But before you think — oh that’s a book full of cakes for girls, grab this book and check out the Vampire Cake, the Football Cake, and the Construction Cake. I am not kidding when I say there is something for everyone and every occasion. And every single cake has a fun surprise inside just waiting to wow your family/friends/guests. I bet you’re thinking — holy crap those look like they are hard to make. You would think, right? 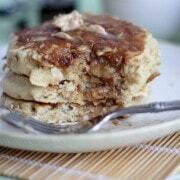 But Amanda makes it simple with tons of great tips and step-by-step instructions and photos. It is approachable, exciting and so.much.fun. If you want more surprise-inside fun, make sure to follow Amanda on Facebook! Order the book and get baking! Or you can enter to win one! 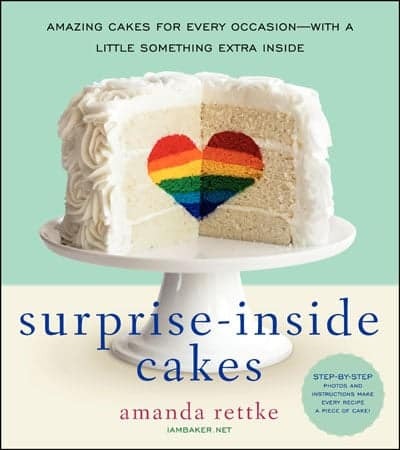 Giveaway Details: One (1) winner will receive a copy of Surprise-Inside Cakes by Amanda Rettke. How to Enter: Simply leave a comment below telling me who you’d make your first cake for! And if you’re feeling chatty — tell me what it would look like! Fine print: Must be over the age of 18 and have a US mailing address. Winner will be chosen using random.org. Prize will be shipped by publisher. Winner will be contacted via email and will have 48 hours to respond before a new winner is chosen. Entries will be accepted up until midnight EST on 3/21/14. 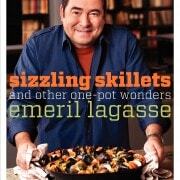 Disclosure: I was provided with a review copy of this book at no charge but was not compensated for my review. I love Amanda and her blog but all opinions regarding the book are completely my own. Post contains an affiliate link. My husband. He’s great! cheers! I’d make one for my best friend who has a birthday coming up soon. I would love to make a cake for our weekly family dinner, maybe with a flower in the middle to celebrate the beginning of spring!! I would make the cake for myself. My 30th birthday is coming up so it would be fun to have a cool cake for my party! I would like to do a big pink star in the center!!!!! Food equals love, right? Especially when you are baking for the “apple of your eye”. Thanks so much for sharing this! Sounds like it will be an amazing celebration regardless of what he cake looks like! Congrats to him — and you!! It would be so hard to choose. But, I think the cross for Easter or the heart one would be my first. I would make my first cake for my boyfriend! It’s our 3 year anniversary on the 19th! My first cake would be for my 6 year old daughter….she saw the pics from this book and was in awe! she’d love the rainbow cake! I’d make the butterfly inside cake for the family just for fun! I would definitely have to make one of those heart cakes for my boyfriend’s birthday in May. I would change the heart colors to an ombre blue, though! I am also sure that I will be able to find an amazing Easter cake as well! Something pastel and pretty. you mentioned a bunny cake?! I tried making one last year and he turned out a little derpy. Thanks so much for the giveaway! My parents turn 60 this year, so I’d make them a special cake for a joint celebration! I will make a Fourth of July cake … Flag in the center … A challenge but one I am ready for! I would make a fun one for my little guy. He loves sweets and his smile is priceless! 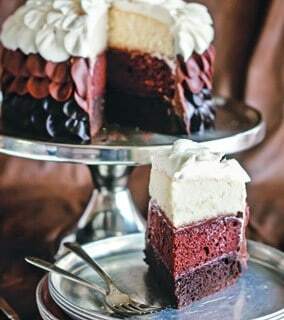 The only cake that I haven’t made yet would be for my husband for our anniversary. He loves yellow cake with a lemon pudding and a light creamy frosting. I’d make a cake for my husband and son! I would make it for my husband-most likely for Easter. My mom! she has the next birthday! I would love to bake one of these happy cakes for my sweet grandchildren!!! I would make a surprise cake for my family and not tell them there’s something inside (surprise!)!! I’d like to make a cake for my daughter’s birthday. Beautiful book, and beautiful cakes! I would make one for all the members in the family here in Caldwell ~ that would be eleven ~ and then I would hope one of them would make ME one!! Any one of the cakes would be wonderful!! That cake with the heart looks SICK (apparently sick means cool according to my young sons)! I would make a cake for my wife and kids. Not sure what it would look like but from the book’s cover it could be just about anything. A baseball outside with a bat on the inside would go over well especially with the season upon us. I would love to have this book. I love to bake but don’t know how to decorate my cakes, especially b-day cakes. I know this book would come to my rescue! I would first bake for my Little Girl, her birthday is coming up next. :) And she love surprises! Also she loves rainbow. I would try to make the rainbow heart cake for her. Can’t wait! :) Thanks for hosting the giveaway. I would make a super fun birthday cake for my son. I’d make a cake for my baby boy….now 24!! The rainbow cakes would “WOW” my soon to be kindergardener grand daughter, Dierdre. Not weird at all. Can’t wait to bake some cakes! Such a gorgeous book. I could use this for my daughter’s birthday. 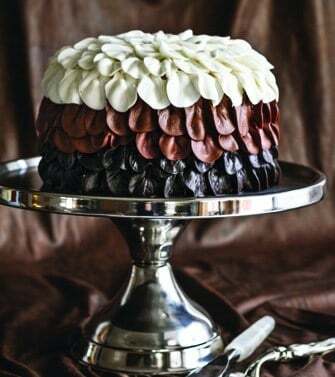 I would love to make an ombre cake in browns for my Dad for his upcoming March birthday! I would make my first cake for my daughter it would be the bunny cake it is so cute! I would make one for my husband with a big Hershey Kiss in it. I think I’d make the first cake the Christmas tree cake, and make it for my themed party, MY FAVORITE THINGS. I had my first one last year, and my friends are already talking about this year’s! :) Thanks for the generous giveaway!! I would make one for my family, probably for Easter. My grandbaby will be 1 year old soon. It would be nice to make a fun cake from this book. I would make my first cake for my youngest son’s high school graduation party. I’d make a cake for my husband and daughter because they LOVE cake! i would make one for my husband first and foremost!!! My niece just had a baby so it would be for her! I would make a surprise cake for my hubby. 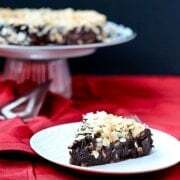 He loves chocolate so I may make an ombre layer cake? Amanda makes the most beautiful cakes! I can’t wait to get my hands on a copy of her book and bake a fun cake for my sisters birthday that is coming up soon. Thanks for the giveaway, Rachel! I’d definitely make my husband a cake and be super cheesy and make a heart in the middle! His birthday is this summer so I definitely need to start practicing. I would make my first cake for my daughter’s high school graduation. She would love to cut the cake and find something special inside. I would love to make a special birthday cake for my grand daughter. I would make my first cake for my daughter for her birthday …I really like the colored layers cake. I’d make my first cake for my daughters’s 13th birthday next month. I think I would try something for Memorial Day. My friends usually throw a big get together with horseshoes and barbecue. I think it’ll be great. I would make one for my friends birthday next month. The hard part would be choosing which one. First cake would go to my family! They always want first taste whenever I make something new and I’ve been dying to try some new pipping techniques and this would be the perfect chance. 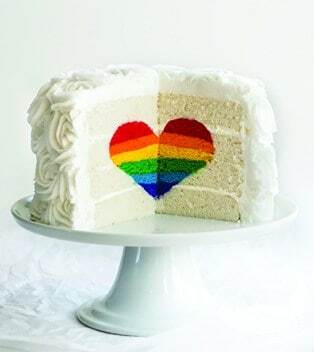 I think I’d make the rainbow heart cake. I can just hear the ooohs and aahs when the first slice is cut and served! This is the reaction I love to hear when I make a special cake, and why I loved creating surprises. If I don’t win, I’m going to buy this book! I would love this for my mother, with dementia, who loves little finds in everyday things! My first cake would be an Easter cake with an Easter egg inside. Thanks for the chance to win. My first cake would be for a grandchild. We just had one birthday and there are 4 more coming up shortly. I’m not sure what cake I would make; it would depend on the child’s interest. I would make my first cake for my husband – his birthday is right around the corner! I would make my first cake for one of my children, can’t decide which one yet though! I would make a rainbow cake for my granddaughter Elizabeth. My husband, he’s going to be 60!!! I think right now the love rainbow one !!! My daughter. Her birthday is coming up next month. I always try to make a special cake. We were just talking ideas last night. This would give me lots of fresh ideas! The tricolor chocolate cake looks delicious and is so unique, a perfect cake for my daughter’s birthday. So fun! The first cake I’d make would be for my brother’s college graduation party. I’d make a cake for my youngest daughter’s upcoming third birthday! She’d be so excited! I would make one for my friend Christine, and since her favorite color is green I would do a green ombre effect layer cake!! A bday cake for my daughter. She loves hearts, so there would have to be a heart inside of course. 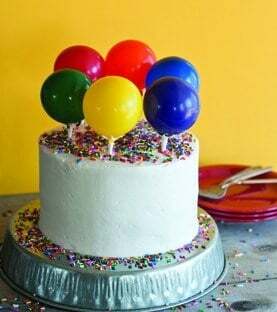 I would make a cake for one of my kids…my son would love the balloon one! Fantastic cakes! I would give the book to my daughter and she could make the first cake for me. I would love to make a surprise cake for my sons birthday. This book looks great. Thanks for the chance to win it. Most likely I would make the first cake for my co-workers. They get really excited when I bring food to work! But after testing the cake on them, I would definitely make one for my best friend’s birthday! I would love to make a surprise cake for my son’s birthday in April. I would love to do an American flag inside for his Captain America birthday! My niece would love to help me make some of these cakes! At 4yrs old she loves to help in the kitchen! I fell in love with the Ombre Cake, I think it would be fun to make for Father’s Day. Don’t know which one I would pick as evetthing looks sooo good.